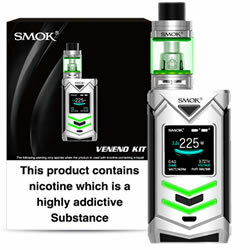 SMOK Veneno - SILVER BLACK FULL kit buy from NUCIG UK. Here comes the SMOK Veneno 225W TC Kit, with an ergonomically designed, decorating with seven LED lights at front and back, which will shine your vaping experience. 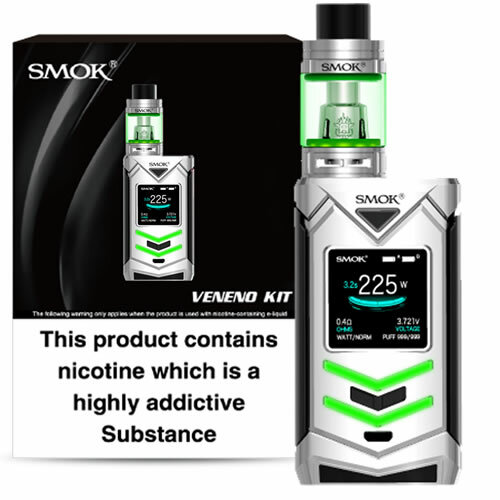 The SMOK Veneno Kit features 1.3 inch colorful screen and big fire key, works with two 18650 batteries, the output power can up to 230W, available in 3 modes for you:VW,TC and Memmory modes. The TFV8 Big Baby Light Edition features, top filling and adjustable bottom airflow control, perfectly match with V8 Baby coils for nice flavor and massive cloud. Good piece of hardware with lots of user controls to get that perfect vape. I use 80%VG and gets oodles of clouds. Everything I could wish for and more. Great Xmas present which gives great flavour and plenty of clouds.